Ride a winter bike, build an igloo, creatively design your own sled – or dare to peer out of the north face of the Eiger or spend a night under the open sky? Whatever you choose: your team experience is guaranteed to be unique! Perhaps not everyone in your team is over the moon about skiing or snowboarding. Or keen to ride a sled at speed down into the valley. That’s quite understandable, but it’s no reason for you to dispense with a team event. Offer the increasingly popular option of winter biking, i.e. cycling in the snow, and everyone will want to take part! 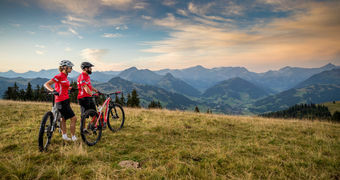 In the Gstaad holiday region, and in Sparenmoos above Zweisimmen in particular, winter bikers have access to exciting routes along wonderfully sited hiking trails. Cycling along these prepared trails is officially permitted and can be done without professional equipment or the need to be in peak physical condition. 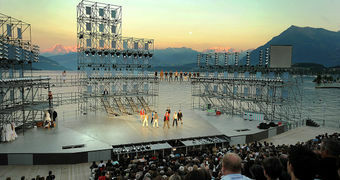 Making it the ideal team event for an active get-together! Some people can only get into ice if it’s in their drink, or if it involves a puck, but this team outing is a guaranteed winner. Just like the Inuit in the Arctic, you and your team will get to stack one block of ice onto the next and marvel at the result. You get to build your very own team igloo under expert guidance, equipped with all the right tools available on site and comfortable gloves. Both the meeting place and the starting time are arranged by agreement, offering you a choice of locations to build your igloo in the Bernese Oberland. It also means the half-day needed to build the igloo can be scheduled to tie in perfectly with your team’s arrival or departure. And once the work is done, the whole team gets to enjoy a cheese fondue inside the natural shelter they themselves have built. The perfect opportunity to create something together and tap into that all-important team energy! Creativity and a hands-on approach are two skills much in demand within a team – and all the more so with this event. In the Jungfrau Region that boasts amazing panoramic views of the Eiger you and your team will get to build your very own sled and then test it there and then, in the snow. Whether it’s old car tyres, wooden shutters, padding, or cardboard, with a little creative flair and a dash of pioneering spirit your team members will get to cobble together some fun and ingenious sleds and snowmobiles. The possibilities are limitless, so you can nail, carve and glue away to your heart’s content. Of course, no creative process would be complete without some flag or pennant-based decoration or even a company logo. A creative opportunity to promote team spirit and put those ‘doer’ qualities to the test! Very few mountains are as unique as the north face of the Eiger, with its height of some 2,000 metres and its extraordinarily steep and rugged environment. The fact that this sheer wall can now be experienced by those with little or no experience of the mountains opens us previously unsuspected moments for you and your team. In an extremely exclusive setting you can now get to experience close-up the quirks and particularities of the north face of the Eiger. Kitted out with the right equipment you will travel by train directly to the Stollenloch [gallery opening]; then, once well secured, you will climb out of the Stollenfenster [gallery window]. With the adrenaline gushing, you’ll sense what it means to stand together as a team and find your rightful place, all under the careful guidance of experienced mountain guides. After this adventure as a group, you’ll certainly be taking far more than just the staggering views of the Grindelwald valley back home with you. A high-alpine experience guaranteed to bond a team once and for all! A team event as an outdoor experience: Funkeln im Dunkeln, literally ‘sparkles in the darkness’, a night beneath the stars! Venture out under the stars with your crew and staff and let nature in its purest form delight you, far from all apps and all the chats. Setting up your place to sleep is already a memorable experience; after all, it might be on a cliff face, free-hanging on a ‘portaledge’ high above the ground, or right in the middle of a snowfield. Getting the meal ready, eating together as a group, and keeping warm and cosy around the campfire is the ideal time for team members to swap fun and memorable anecdotes or simply soak it all up. And no-one on your team is likely to forget the moment when the new day slowly dawns and the first rays of sunshine emerge on the horizon. A pure nature & team experience under the open skies!